Yup, this me. Pretty aren’t I? I love toys almost as much as I do eating. Sometimes I try to do both at the same time – eat a toy! I haven’t done this for a while because I’m so much more savvy now but there was a time when I thought it would be uber-cool to eat nylons. No, silly – not the kind that has two legs, just the knee – high kind. I like the way they filled up my mouth even though I don’t remember them being particularly tasty. I ended up at the vet’s and spent the night in a kennel. Let me tell you – their accommodations are way over – rated. The second time I tried to eat a nylon, my fur-less Mom saw what I had done and reached into my throat and out it came – all slimy and yukky. I didn’t like the feeling so decided maybe eating nylons wasn’t such a good idea. To any dogs out there – beware! Been there – done that. The next time I decided to eat something different – a piece of plastic toy. No, not a complete toy, just a little piece of toy that someone tossed on the ground. The problem was that it lodged in my stomach and wouldn’t come out. I also got an infection and spent a week at an emergency veterinarian clinic. I had to be operated on. Nobody brought me flowers but boy, there sure were a lot of tears when people came to visit. The nice ladies at the vet’s would lay me out on a trolley and bring me out to a visitor’s room because I was too weak to do anything but lay there. I have to admit it – even if they had brought me a nice treat I couldn’t have eaten it. I almost died. Then I started to feel much better. I continued to lie on the trolley however, and gazed at my fur-less parents in my best “poor me” look. Boy, did I ever get attention! I kinda liked it… all that patting and cooing. I could get used to this!! But the jig was up one day when they brought me a treat and I just couldn’t say no. Busted! They knew that the last couple of days had been an act. My stomach was getting me into trouble again! Those days are behind me. Now I get human food because of my cancer. It’s a lot tastier than dry dog food and the menu changes daily. If I don’t like something I just sit by my dish and give them my best “Is this all there is? look. If I wait long enough, a new menu item comes my way. I have them well-trained. Until next time. Don’t forget to hug your pet today! PS: Did you know that the second week in December is International Santa Paws Week? PSS: Are there any other dogs, or even…cats… who would like to write to me out there? You ate a nylon, really? Wow, I ate my dads house phone, well he left it outside on the deck so I carried it away and buried it in the garden, now that was fun. I ate the stereo wires once, he wasn’t using it anywise and apparently it wasn’t plugged in, now that would have been shocking. I have never really destroyed anything like my friend Tika. 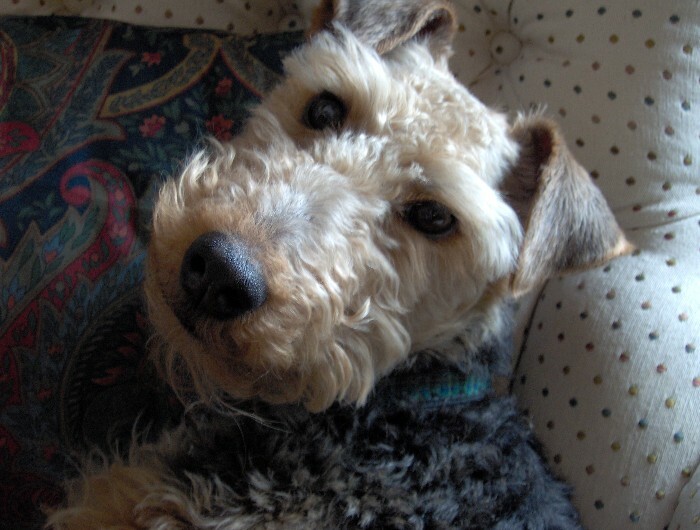 She is a Lakeland terrier and she use to live close to you in the Highlands. Now she can be a terror. I did eat a peach pit that my dads cousin from Ireland left on her bed side table, don’t tell him I was on her bed, I think I had it in my tummy for a few weeks, not sure how I ate now that I think of it. Well one day I had had enough and I decided to throw it up. Well did I every make an ordeal out of that. You should have heard the noise I was making. Made Céline Dion on the Titanic look tame. OMG. Well when all was said and done I did actually try to swallow it again. That apparently was not going to happen. Have to run I think someone is lurking outside and I need to go and bark, one needs to look important for treats around this place sometimes. Ruff ruff, Taffy. You are such a smart dog, just like me. My name is Spike, I am a five year old longhair Chihuahua and am an only child. Last month my parents thought I would like a little sister, even though I never asked for one. They brought a tiny short hair Chihuahua home for me to play with but we did not get along very well. She was not very well housetrained and pretty soon I was behaving like her, which was pretty hard on the area rugs in my house. I got very depressed and physically ill because I felt unloved. My parents decided to return her to the breeder and after a week or so, I recovered and am feeling alot better now. The lesson my parents learned was – if you have a perfect pet (like me), why would you want any other? I’m happy again. Woof, Woof Spike! Nice to meet a new pal. I had the same experience but mine was with a Daschund. He decided my furless Mom was his and Olie (his name) would not let me come anywhere near her. He growled when she hugged me and one day he attacked me. That was the end of that. Whew! Some of our brothers just don’t like to share.